If your contact center handles high call volume, you may want to check the status of agents serving the queues. Are they logged in and available to take calls or have they logged out or on break? This helps improve calling experience for your callers. 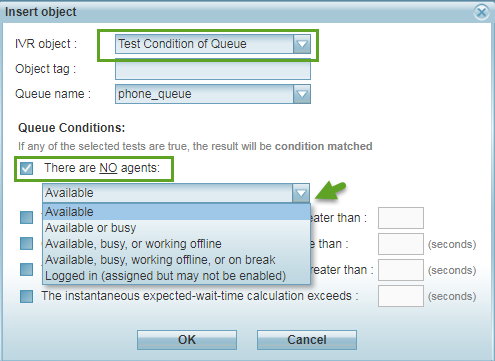 We have now introduced improved parameters that helps checking the condition of a call queue. The Test Queue object in our scripts tests the condition of a queue before a call enters the queue. With the new improvements, scripts provides in-queue treatments, checking the perspective of a call in-queue, such as the caller’s position in the queue and how long it has been waiting in the queue. Sometimes callers prefer to know their status to decide if they want to wait longer, leave a voice message, or request a call back. A message can also be announced to the caller at specific intervals. The current call improvement applies to Test Queues only. Both the Test Queue and Forward to Queue objects in the scripts check the agent's availability at a more granular level and decide if a call should enter that queue, sent to a voicemail, or forwarded to another queue. For example, a call enters a queue if the test queue shows agents are logged in and available to take the calls and/or and busy handling another call. But the call is sent to a voicemail or another queue if the agents of a queue are offline, on break, or not logged in. Tracks how much help is available before forwarding a call to a queue. Checks whether the agents are available, busy, offline, on break, or logged out. Adds a call-in-queue perspective, and that how long a call has been waiting in the queue. This applies to Test Queue only. Provides queue visibility to the callers; helps them decide their next action, prevents callers' frustration, and provides better user experience. To understand the usability of In-queue treatments and enhancements, let's look at the call flow requirements for AcmeHealth Clinic, a fictitious health clinic. AcmeHealth wants to ensure best calling experience for their callers at all times. When the clinic is experiencing high call volume, callers to AcmeHealth can be informed of their queue position and an approximate waiting time before being served. 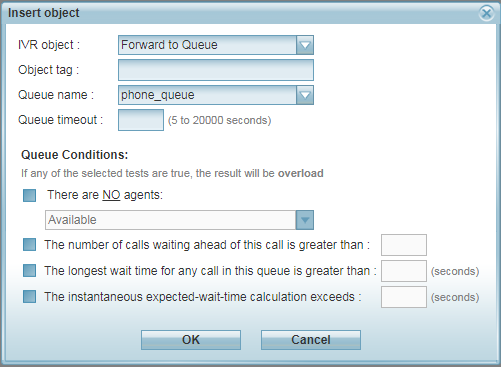 By introducing test queues in scripts to check the condition of the queue, you can inform a caller their position in the queue and how long they should wait to be served by a representative. For example: there are 10 more callers ahead of you. Your approximate waiting time is eight minutes. You can end the call now and we will call you back, or you can continue to wait in the queue. The clinic checks if they have sufficient number of care representatives logged in to serve the callers. You can insert Test Condition of Queue object anywhere in the IVR tree. The test queue has two exit points: condition matched or condition not matched. When the test conditions are met, the next set of actions are triggered in IVR. The test queue checks if there are no agents logged into the tenant. If the condition matches, plays an emergency closure message and terminates the call. If the condition does not match indicating agents are logged in, the next test queue triggers checking if the logged in agents are available, available and busy, and so on. Go to Scripts and click to add a new Script. In the Main IVR, click add to insert an object. Select Test Condition of Queue and enter an Object tag. The number of calls waiting ahead of this call is greater than -----. Indicates the volume of calls in the queue and determines whether to let the call in the queue or reroute it. Current call has been waiting in this queue for more than --- (seconds). This new option checks to see if the time the current call has spent in its queue exceeds a configurable threshold. Each incoming call gets its own copy of an IVR script to receive treatments. The call being treated is referred to as the Current call. The longest wait time for any call in this queue is greater than --- (seconds). Hints the expected wait time in the queue given the number of calls waiting ahead of this call. The instantaneous expected-wait-time calculation exceeds --- (seconds). Enter a time duration in seconds. The Forward to queue object forwards a phone interaction to a specific phone queue. With the new improvements, just like test queue condition, you can track how much help is available before forwarding a call to a queue. We can now check if the agents are available, busy, offline, on break, or logged out. This enhancement applies to both Test Queue and Forward to Queue objects. Select Forward to Queue and enter an Object tag. The number of calls waiting ahead of this call is greater than ----- . This value must be 0 or greater. The longest wait time for any call in this queue is greater than ----- (seconds) . The instantaneous expected-wait-time calculation exceeds --- (seconds) . Click OK to close the object.